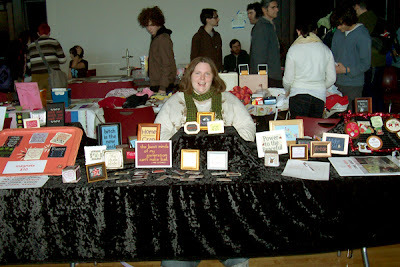 On Sunday October 28th 2007, two of Boston Handmade’s members participated in the Mass.Market at MassArt. The event reflected the former Punk Rock Flea Markets that had been held at MassArt over the past several years. The Mass.Market featured over 40 vendors and DJs which made for an exciting venue chock full of crafters such as button makers, paper crafters, book makers, artists, clothing designers, djs, vegan and vegetarian bakers, and more. 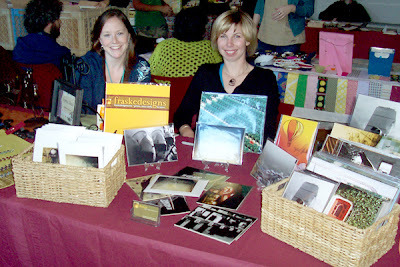 Amberly of alt_cross_stitch and Allison of Fraske Designs set up at neighboring tables in the middle of the action to sell their wares. Both Amberly and Allison agree that the Mass.Market was a great selling experience and look forward to future fairs held at MassArt!